JOEL SALATIN is a third generation family farmer working his land in Virginia's Shenandoah Valley with mother, Lucille, wife, Teresa, daughter, Rachel, son, Daniel, daughter-in-law, Sheri, grandsons, Travis and Andrew, and granddaughter, Lauryn, along with a cadre of employees, subcontractors, apprentices, and interns. 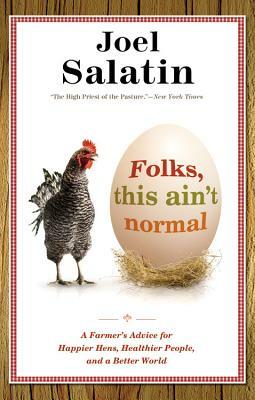 "Joel Salatin is a down-to-earth 21st century pioneer, one of those rare contrarian thinkers whose words and work have the power to transform the way a generation thinks. 'Folks This Ain't Normal' will help seed the new nature movement and inspire people everywhere -- especially young people in need of some practical hope. And here's the bonus: The book is great fun to read. Sacred cows beware. "—Richard Louv, author of "The Nature Principle" and "Last Child in the Woods"